Modern Portfolio Theory doesn’t work with cryptocurrencies. In a cryptocurrency portfolio, it’s all about managing risk. As the cryptocurrency space matures, more high-level allocation models will become relevant. Aside from the obvious (that cryptocurrencies are not companies, they’re just software and the network of people involved), MPT asks the portfolio manager to make some basic assumptions. Both of these are a big problem for cryptocurrencies, because the probable return is somewhere between zero and 100x, and nearly every cryptocurrency in the top 20 is highly correlated with bitcoin (at least for now). What about building a cryptocurrency portfolio based on sector? 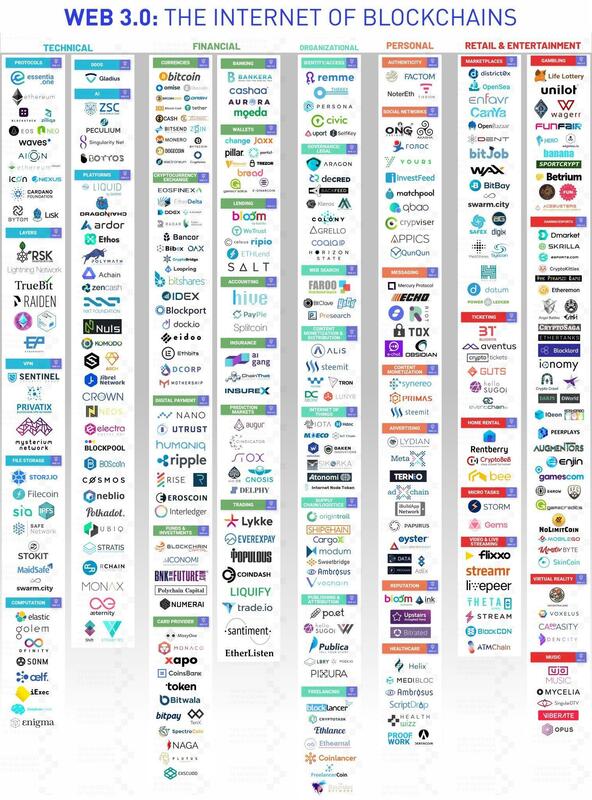 I’d like to tell you that it’s possible to just look at the different categories of cryptocurrency projects out there, and just build a sector weighted portfolio like you might do with traditional equities. If that were possible, you might want to use a chart like this to narrow down your choices. Or, perhaps one like this. But unfortunately, we can’t have nice things. Recall that 80% of ICOs in the last year are dead already or were simply scams in the first place (the real figure is probably over 90% now). So, what can we do? We could just skip cryptocurrency all together, or we could take a different approach. In order to build your own cryptocurrency portfolio, I’m going to give you a list of questions to ask. This list is not exhaustive, but it’s a good place to start. Can I replace the word “blockchain” with database? This one comes from Andreas Antonopoulos. If the problem the project is trying to solve would work just as well without a blockchain, then we have a problem. Blockchains are slow, expensive data structures that when used properly can operate in a hostile environment with nobody at the helm. If performance and control are important, a blockchain is probably not the correct tool for the job. One of the main reasons that bitcoin has been successful is that the code is open source. This allows the community to share ideas and work together to solve problems that they find interesting and even exciting. Projects that hide their code away should be viewed with suspicion as many bugs could be lingering behind the walled gardens. Remember, closed systems maximize control while open systems maximize innovation at the edge. Can I rent enough hash power to 51% this network right now? Many cryptocurrencies are secured by proof of work. However, not all coins are created equal. Mining secures a PoW coin, but it can also be its downfall. For example, Ethereum (ETH-USD) shares a mining algorithm with Ethereum Classic (ETC-USD). However, Ethereum has attracted 20x more hash power than Ethereum Classic, which means that if you go to Nicehash, you can rent enough hash power to just take over Ethereum Classic for about $16,330 per hour. The reason for this is that the Ethash algorithm can be run on just about any GPU, so by using a marketplace for renting hash power, anyone that wants to can literally take over a the cryptocurrency of their choice if they pay the price. However, not all coins can be hijacked in this way. Some coins like Bitcoin (BTC-USD) are so huge that only 1% of the necessary hardware could be rented for such an attack. 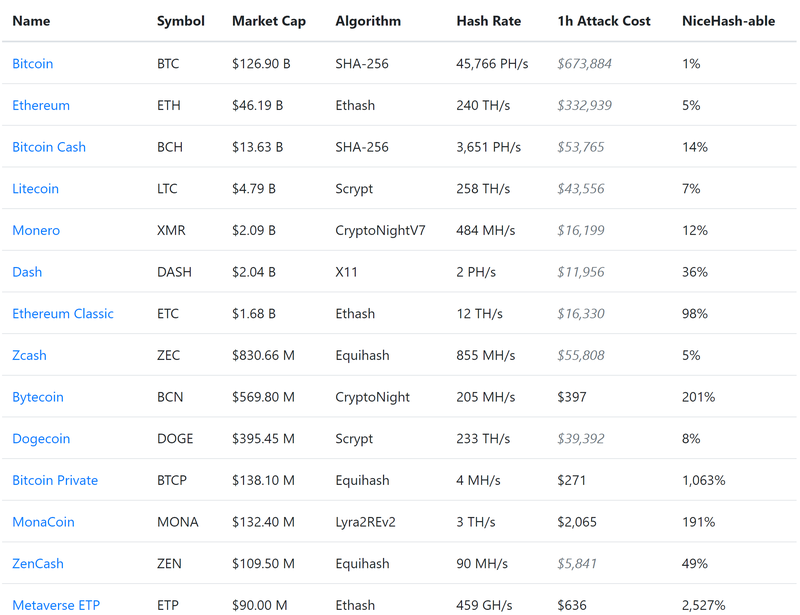 Any coin that shares the SHA-256 algorithm is orders of magnitude easier to attack than bitcoin because bitcoin is the most profitable to mine, so that’s the network that the miners point their hardware at. Bitcoin Cash (BCH-USD), for example, can be attacked with 1/14th the hardware that you would need to attack bitcoin, making it much less secure from a 51% attack standpoint. Does the coin have a fancy new security model or data structure? If it does, it might just be the next big thing. But, more likely the security model has major flaws that have yet to be discovered. 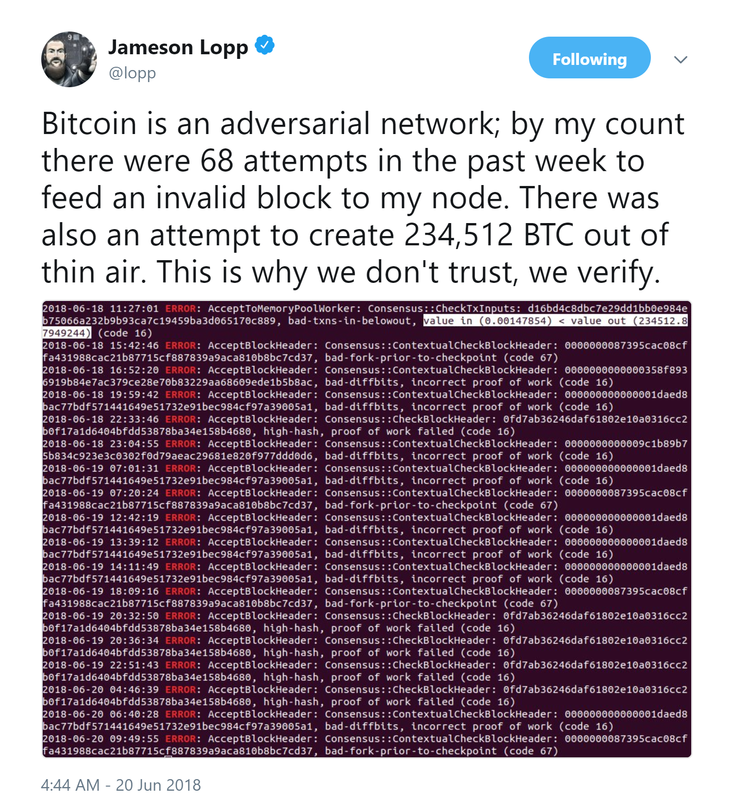 Bitcoin’s blockchain and proof of work has been operating in the wild since 2009, and it has been attacked constantly. Smaller cryptocurrencies have the disadvantage of not being in the spotlight, so their networks’ bandwidth and security are tested at only a fraction of the pressure placed on larger networks like Bitcoin and Ethereum. This doesn’t mean that we should stop trying to innovate, we just need to understand that the risk/reward ratio for these new concepts should be seen as orders of magnitude higher than that of Bitcoin and Ethereum because of the fact that they just haven’t been around long enough, they haven’t grown large enough to really be put to the test. Some examples of this are the tangle, block lattice, and delegated proof of stake. They might be great ideas, they might even be the future, but betting on them now is a different animal than investing in Bitcoin. Can this cryptocurrency be properly secured (preferably in a hardware wallet) in cold storage? As I wrote about in my blog, part of the joy of investing in cryptocurrencies is understanding how to take custody of the assets. While there are many ways to secure cryptocurrency, my preference is to use a hardware wallet and store the coins offline (cold storage). There are some really cool projects I’d like to invest in, but I just don’t want to deal with the mess of having to run full nodes of each project on my local machine, or worrying about if my paper wallet is safe. A hardware wallet like Trezor or Ledger Nano S can store many of the top cryptocurrencies is a highly secure manner. As a fiduciary, I owe it to my investors to use the best security possible, so I rarely invest in cryptocurrencies that cannot be stored in a hardware wallet. Is anyone using this cryptocurrency, and are there any software engineers working on the project still? These seem like basic questions that you wouldn’t have to worry about if you were investing in a traditional company. I mean, nobody asks “I wonder if any software engineers at Amazon are writing code this month?” before buying Amazon (AMZN). But, with cryptocurrency things are a bit different. Some projects I would like to invest in fail at this step. Either the number of transactions does not seem to be growing, or the development team seems to have wandered off. Two projects I would be investing in if they were actively maintained are Dogecoin (DOGE-USD) and Litecoin (LTC-USD). See the development activity below. With no active development team, these projects simply can’t survive. Does the team behind this project inspire confidence, and can they be identified? In order to reduce the odds that the cryptocurrency project that you’re thinking about investing in is a scam, it’s worthwhile to take a look at the founders. If you can’t find a way to identify them, and their past work, then what kind of recourse do you have if they just take the funds and vanish? Is there a whitepaper, and does it make sense? You can learn a lot about a cryptocurrency project from the whitepaper. In fact, I think it’s a great place to start. Also, you might want to check that the entire thing wasn’t copied and pasted, because that’s a thing that happens all the time. What is the token’s issuance model? Bitcoin has a fixed issuance model that will result in 21 million tokens being created by the year 2140, but many other coins have no set maximum supply. Also, some of these ICOs have large portions of the tokens set aside for their foundation and early stage investors (and they probably bought it at a discounted rate before the rest of us even heard about the project). Tokens that restrict the supply tend to be worth more as long as they can attract actual usage. It’s important to understand how new tokens are issued if you are trying to predict what they might be worth in the future if the project achieves the goals it set out for itself. I think that as the cryptocurrency market matures we will start being able to apply the more traditional valuation models. I think that when traditional assets start being tokenized, then it won’t be uncommon to have crypto assets in a traditional portfolio much in the same way that we have derivatives, ETFs, mutual funds and equities all in the same E-Trade (ETFC) account now. Imagine having a basket of foreign currencies with some bitcoin thrown in, or a basket of utility companies that includes blockchain-based power tokens representing claims of future energy production. I think that crypto assets will just become a tool, a technological means to an end in the future. Tokenizing existing assets and the discovery of new assets to tokenize may well define the digital revolution as we move into a world where the Internet of Things becomes a vivid reality. If you like this article, you will love Crypto Blue Chips, where this idea was discussed first. Besides posting articles early, there’s research in Crypto Blue Chips you can’t get anywhere else, like the BVIPE, the Bitcoin Value Indicator Professional Edition, posted with updates every week. Also, you can follow along as I build a portfolio of cryptocurrencies that we’ll be holding for the next 1-3 years. Get in on the ground floor with Crypto Blue Chips. This entry was posted in Crypto and tagged Bitcoin, cryptocurrency on September 13, 2018 by Bone Fish. We may have found the reason for Bitcoin’s persistent weakness over the past week. After hitting a price above $8,000 thanks to recent Blackrock ETF speculation, the cryptocurrency has dropped 10% in the past week, dropping as low as $7,300 today, leaving traders stumped what was causing this latest selloff in the absence of market-moving news. It turns out the reason may have been a good, old-fashioned margin call forced liquidation, because as Bloomberg reports a massive wrong-way bet left an unidentified bitcoin futures trader unable to cover losses, resulting in a margin call that has “bailed-in” counter parties forced to chip in and cover the shortfall, while threatening to crush confidence in yet another major cryptocurrency venues. The exchange, which identified the problem trader only by an anonymous ID number 2051247, said the position was initiated at 2 a.m. Hong Kong time on July 31. The exchange was forced to inject 2,500 Bitcoins, roughly $18 million at current prices, into an insurance fund to help minimize the impact on clients. And since OKEx has a “socialized clawback” policy for such instances, it also forced other futures traders with unrealized gains this week to give up about 18 percent of their profits. The episode underscores the risks of trading on lightly regulated virtual currency venues, which often allow high levels of leverage and lack the protections investors have come to expect from traditional stock and bond markets. Crypto platforms have been dogged by everything from outages to hacks to market manipulation over the past few years, a period when spectacular swings in Bitcoin and its ilk attracted hordes of new traders from all over the world. “Everyone is talking about it,” said Jake Smith, a Tokyo-based adviser to Bitcoin.com, in reference to the OKEx trade. And while everyone also wants to now how much capital was actually at risk, the biggest question is just how much margin there was in the trade. The problem here is that the exchange – ranked No. 2 by traded value – allows clients to leverage their positions by as much as 20 times. For those who rhetorcially tend to ask “what can possibly go wrong” after every bitcoin slump, well now you know. OKEx, which requires traders to pass a quiz on its rules before they can begin investing in futures, outlined planned changes to its margin system and liquidation procedures that it said would “vastly minimize the size of forced liquidation positions” and make clawbacks less frequent. According to Bloomberg, clawbacks are unique to crypto markets and expose the exchanges who use them to reputational risks when clients are forced to absorb losses, said Tiantian Kullander, a former Morgan Stanley trader who co-founded crypto trading firm Amber AI Group. “It’s a weird mechanism,” Kullander said. Finally, judging by the bounce in bitcoin, the market appears relieved that it has identified the culprit of the selling, and with no more liquidation overhang left, is once again pushing prices across the crypto space higher. This entry was posted in Crypto and tagged Bitcoin, cryptocurrency, margin call on August 3, 2018 by Bone Fish. What is the next step when you have a speculative asset whose value ( may go to zero or $250,000 ) in the near future? Why start writing insurance policies on it, of course! That’s the line of logic employed in the world of cryptocurrencies, as the newly formed crypto insurance business is booming. To be sure, there is ample demand and soaring interest in crypto insurance, according to Bloomberg. After all, with fat premiums and no insurer on record to date of ever paying out a claim, why wouldn’t there be? Furthermore, one can rarely go a few weeks without a headline about a major crypto exchange getting hacked, sometimes with hundreds of millions of dollars being lost in the process. Such was the case with the hacks of Bitfinex and Mt. Gox. Remember this stud? 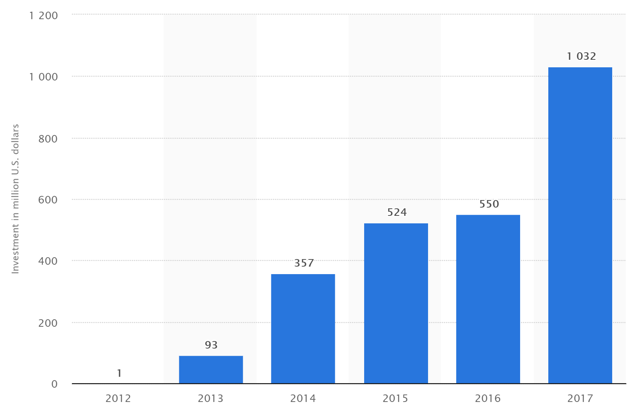 In addition, two other major crypto-insurance shops – Marsh & McLennan and Aon – said business has been booming over the last year. While the cost is still beyond reach for many fledgling companies, Marsh & McLennan and Aon, the two leading insurance brokers that help companies shop for crypto policies, say business has been brisk this year. For the first time, Marsh formed a team of 10 dedicated to servicing blockchain startups. Aon, which claims to have over 50 percent of the market for crypto insurance, recently streamlined its standard policy form to speed up the underwriting process. It has also seen some insurers tweak general company policies to include crypto-specific protections. There may be a simple explanation for the enthusiasm to sell insurance: Marsh and Aon said that, so far, they are not aware of any insurance companies that have had to actually pay out on any claims, even as 2018 is supposed to be the “busiest year for hacks on record”. It’s probably safe to say that it won’t be long before claims are paid out. Big ones. Meanwhile, demand for insurance will only grow as it gives start-ups an air of credibility when try to raise capital, providing some modest cover for a business that has generally been speculative and regarded as somewhat dangerous. It’s no small irony that the crypto industry, which originally sprung out of a techno-utopian desire to liberate its users from the traditional financial system, is embracing insurance as a way to go mainstream. For example, Trustology, a London-based startup focused on crypto custody services, is in talks to obtain coverage that would insure its customer accounts up to 85,000 pounds — the same standard as a U.K. bank account — to help attract more clients. It’s also looking at self-insuring client funds. And while even major crypto exchanges like Coinbase are starting to buy this type of insurance, in the case of the most popular US crypto exchange, it is only on a “fraction” of their holdings. Coinbase, one of the most widely used crypto exchanges, buys insurance for a fraction of the digital coins it holds. Funds stored in so-called hot wallets, which may contain up to 2 percent of client assets and are used in active trading, are covered. Coinbase’s disclosures don’t provide details on how much coverage is provided for its remaining coin deposits, which are stored offline as a security measure. Finally, selling crypto insurance for now remains a goldmine, with insurance companies able to charge a significant premiums, as underwriters can charge a crypto-related company upwards of five times or more than your average business for coverage against loss or theft, according to Bloomberg. That said, like with any other other financial security boom, where derivatives of derivatives wind up in bloom during the first stage, many are skeptical about how long of a runway the field of crypto insurance will have, especially given the fact that the underlying asset value would will likely be for the determined by regulators in the future – and the decision will likely prove to be extremely volatile, leading to a painful bust for the insurance industry. This entry was posted in Crypto and tagged crypto insurance, cryptocurrency on July 24, 2018 by Bone Fish. DeadCoins similarly has a 830-item long list of “dead” cryptocurrencies. Among them is the recent Titanium Blockchain Infrastructure Services initial coin offering (ICO) that was shut dow by the U.S. Securities and Exchange Commission (SEC) for fraudulent practices. This entry was posted in Crypto and tagged cryptocurrency on July 1, 2018 by Bone Fish. The Digital Currency Research Lab at the People’s Bank of China has filed more than 40 patent applications so far – all as part of an aim to create a digital currency combining the core features of cryptocurrency and the existing monetary system. A national digital fiat currency, say what? Data from China’s State Intellectual Property Office (SIPO) revealed two new patent applications on Friday, pushing the total number submitted by the lab to 41 over the 12 months since its launch. Each of the 41 patent applications focuses on a certain aspect of a digital currency system, and, when combined, would create a technology that issues a digital currency, as well as provides a wallet that stores and transacts the asset in an “end-to-end” fashion. For instance, the most recently revealed patent application explains how the envisioned digital wallet would allow users to check any transactions made through the service, while earlier documents offered details on how the wallet can facilitate transactions. The ultimate goal, according to PBoC’s patents, is to “break the silo between blockchain-based cryptocurrency and the existing monetary system” so that the digital currency can sport cryptocurrency-like features, while being widely used in the existing financial structure. Last week’s patents further explain that the envisioned wallet would not be limited, like a typical cryptocurrency wallet, to merely storing the private key to a certain asset. Nor would it be like another mobile payment service that only reflects a number on an application’s front-end interface without users actually holding the assets in a peer-to-peer manner. Instead, the patents indicates the wallet would store a digital currency issued by the central bank or any authorized central entity that is encrypted like a cryptocurrency with private keys, offers multi-signature security and is held by users in a decentralized way. The research lab said in one of the documents that it believes it is building a mechanism that makes a crypto-featured digital currency more applicable in the financial world. The hybrid approach is also in line with opinions shared by the PBoC’s vice governor Fan Yifei and Yao Qian, the head of the research lab, who have both argued for a balance between the two polars of centralization and decentralization. Overall, the patent applications filed so far signal the continuous efforts made by China’s central bank to develop its own central bank digital currency, as well as to potentially widen the application’s role among other central institutions. This entry was posted in Crypto and tagged Bitcoin, cryptocurrency on June 27, 2018 by Bone Fish. Some people seem to believe that Bitcoin might be worthless, we discuss their arguments. If there was value in Bitcoin, how would we know? Shared delusions, are they useful? (Hans Hauge) If you’ve read anything I’ve written so far, you know that I’m long Bitcoin (BTC-USD). However, that doesn’t mean I’ve turned a blind eye to the crowd that says it’s all an illusion, that Bitcoin is intrinsically worthless. Let’s take a look at who is making these arguments, and what they’re saying. It’s worse than tulips bulbs, it won’t end well. There will be no real non controlled currency in the world. There’s no government that’s going to put up with it for long. So, if I understand correctly, Mr. Dimon’s argument is that every government in the world will soon block all cryptocurrencies. Therefore, Bitcoin is doomed. To me, it’s just dementia. It’s like somebody else is trading turds and you decide you can’t be left out. If I understand correctly, Mr. Buffet believes that Bitcoin is super tasty but very poisonous, like a Big Mac times itself, and Charlie Munger is trying to say that the Bitcoin market is pure FOMO, or the Fear of Missing Out. Therefore, Bitcoin is doomed. I hope you are a data driven person like me. I believe there’s no better way to have a clear understanding when people’s tempers are raging than to just look at data and slowly and carefully think about what makes sense. Let’s start with Jamie Dimon’s argument that all governments in the world will ban Bitcoin. How does this argument stack up? Let’s look at what’s going on in the three largest economies in the world. All governments to ban Bitcoin? While China has placed a temporary ban on Bitcoin exchanges and ICOs, China’s state TV recently said that blockchain could be ten times more valuable that the internet. While it may seem that China is falling in line with Mr. Dimon’s prediction, it’s worth noting that when the latest ban went into effect, business didn’t stop, it just moved to places with a more friendly regulatory environment, such as Switzerland, Japan and South Korea. In Japan, eleven Bitcoin exchanges are recognized by the FSA, and Bitcoin is legal tender. This would seem to be at odds with the idea that every government in the world is going to ban Bitcoin. In the United States, the largest Bitcoin exchange, Coinbase, is backed by ICE, the parent company of the New York Stock Exchange and the Federal reserve has said that they welcome anonymous cryptocurrencies. Bitcoin is classified as a digital asset and exchanges are regulated and must follow KYC and AML. While Bitcoin is not classified as a currency in the US, it certainly isn’t illegal. Saying that the government is going to completely ban Bitcoin is pure speculation, and I hardly think that ICE or the Federal reserve share Mr. Dimon’s opinion. Did you know that ICE is even building its own Bitcoin exchange? When governments move too quickly to ban new technology, the country they represent ends up getting left behind. Coinbase for example, has 20 million users and has traded over 150 billion dollars of cryptocurrencies to date. This kind of economic activity is creating jobs and driving innovation. Will governments regulate cryptocurrency exchanges? Of course, and they already are. Will every government in the world ban cryptocurrency outright? I’m not convinced it’s going to happen, especially with what we’re seeing in the US and Japan so far. Mr. Dimon’s comments would make more sense if they were, I don’t know, maybe trying to patent Bitcoin’s technology and make their own version. But, that would be kind of unethical, don’t you think? I guess it’s not really surprising since J.P. Morgan (JPM) has been fined more than 29 billion dollars for abusing the market since the year 2000. But, Bitcoin is the fraud? Bitcoin value is based on nothing but FOMO? I think people forget that Bitcoin is not some magical beast that lives in isolation. It’s a network with many stakeholders and it represents something different to each group. Bitcoin has created an ecosystem that includes Bitcoin Miners, Software Engineers, Exchanges, Cloud infrastructure like Blockchian as a Service, Merchants, Users, and of course, the speculators and the scammers. FOMO or subject of scholarly research? If Bitcoin was just FOMO, then surely academic interest in the subject would be small, and certainly not growing over time. What’s the big deal after all? FOMO or a life raft for those living in oppressive regimes? If Bitcoin was just speculation, surely the countries with the highest search volume for the term “Bitcoin” would be wealthy countries where people are throwing money around, rather than in troubled places where a censorship resistant currency might be of use. As you can see, with the exception Finland in 2012, the interest is overwhelming coming from troubled geographic areas. FOMO or a source of jobs and innovation? 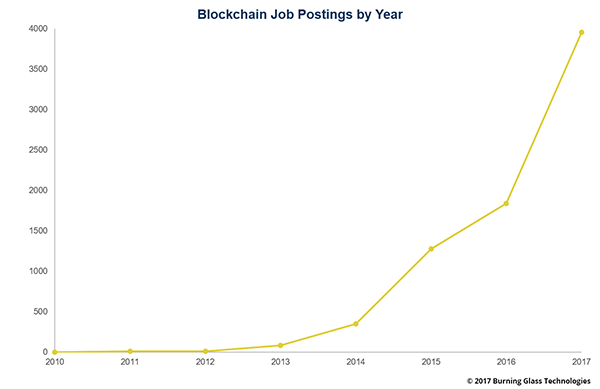 If Bitcoin was just FOMO, surely it wouldn’t be creating jobs, and certainly it wouldn’t be one of the fastest growing fields in technology. FOMO or the new obsession of Venture Capitalists? 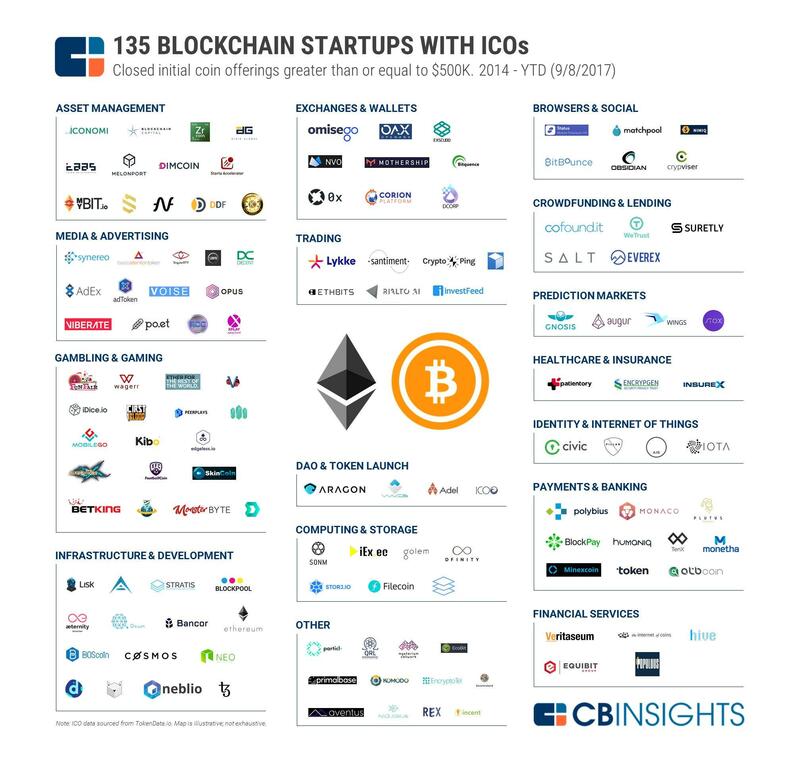 If Bitcoin was just FOMO, then why are VC firms investing more in blockchain startups each year? Maybe some of them are caught up in the craze, but just look at the chart below. To say that Bitcoin has no value is to say that academics (students and professors), governments, venture capitalists, software engineers, hiring managers, and people living in the most troubled areas of the world are completely off their rockers because they dare to challenge our assumptions about what value is and the ways in which it might be transferred. Is Bitcoin a shared delusion? Sure, but so are lines of latitude and longitude, global time standards, our existing money system, right and wrong, cultural norms, beauty, art and hope. The more important question is, does this shared delusion give us something back? Do we gain something by believing in it? For me, the answer is clear. I think Bitcoin is one of the most powerful forces for the rights of the individual. I think Bitcoin can at once weaken the oppressors of the downtrodden and create opportunity for the bold. It may challenge our assumptions that money might come from the crowd, rather than from on high. But, maybe this time it’s up to us to save ourselves? Ask yourself what it might mean to live in a world where currencies exist that reach the entire globe and yet don’t require the backing of a military. I don’t know for sure what it means, but I’ve decided to follow this path and find out for myself, rather than relying on the old guard to hand down truth to me. This entry was posted in Crypto and tagged Bitcoin, cryptocurrency on June 16, 2018 by Bone Fish. Look how fast things happen!! Where did this transaction happen? The first property to be sold this way in the United States. It was sold entirely through the blockchain. Completely. Ethereum was the token used. This puts Vermont on the map. Propy is a company in San Francisco. Propy handled the entire transaction including recording of the documents and contracts instead of using the city system. Vermont is the first state to allow this kind of transaction and soon coming up are Colorado and Arizona. The encryption technology in blockchain is the best available at this time. This transaction used cryptocurrency for the purchase and it was then turned into the fiat money on the other end. The first Bitcoin to Bitcoin transaction in the United States was when Michael Komaransky sold his Miami mansion for 455 Bitcoin which was the most expensive Bitcoin real estate transaction to date. While most people will still not do a cryptocurrency real estate transaction, it is here, and it will be here to stay. The different tokens will fail and others will rise. Ethereum is very stable. Blockchain is here to stay and evolve. This entry was posted in Crypto, Real Estate and tagged cryptocurrency, Ethereum, Last Week Tonight on March 13, 2018 by Bone Fish.